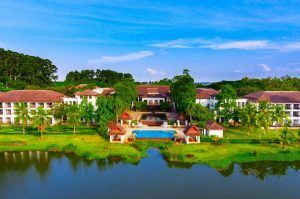 Prachinburi (Thailand) – August 20, 2018 (travelindex) – Best Western Hotels and Resorts will introduce its newest brand, BW Signature Collection by Best Western, to Asia for the first time this year, following the signing of an exquisite lakeside resort – Tawaravadee Resort – in Thailand’s historic Prachinburi province. Nestled in Thailand’s verdant countryside, approximately 160km from Bangkok, this low-rise resort was inspired by the ancient Dvaravati culture that thrived in the area between the 6th and 11th centuries. Light, bright and exuding tropical elegance, this expansive rural retreat is suitable for every occasion. Surrounded by lush greenery, reflective lotus ponds and tropical plants, the hotel features 199 rooms and suites, ranging from traditional Thai rooms with classical local décor to large, luxurious lakeside suites. Guests have a choice of dining options, as the resort’s restaurant is open all day and specializes in Thai, pan-Asian and international cuisine with views of the pool, and the Lobby Lounge serves drinks and snacks throughout the day. In addition, the karaoke rooms are ideal for evening parties. During the day, guests can cool off in the tropical outdoor pool, work out in the fitness center or be pampered in the serene spa, which features massage areas and a sauna. The resort also offers a wide range of activities, including tennis, badminton, cycling, snooker, and a golf driving range. Alternatively, guests can head out and explore the local area, which features forests, waterfalls and ancient ruins. Tawaravadee Resort, BW Signature Collection by Best Western, is also the perfect venue for meetings and events, with extensive function space including an 800-guest convention hall and several other meeting rooms that can cater for between ten and 200 delegates. “BW Signature Collection was created especially for hotels like this. Tawaravadee Resort is a spectacular independent property that perfectly blends its local heritage with international facilities. Within driving distance of Suvarnabhumi Airport, this charming resort is perfect for all types of occasions, from romantic couples’ retreats to fun-filled family holidays. It is also a superb setting for corporate retreats and large-scale events,” commented Olivier Berrivin, Best Western Hotels & Resorts’ Managing Director of International Operations – Asia. “As a member of our BW Signature Collection by Best Western brand, Tawaravadee Resort will now benefit from Best Western’s global support network and commitment to excellence, while guests will receive world-class service, excellent facilities, and the ability to earn Best Western Rewards® points,” Olivier added. Owned by My Green Resident Co., Ltd., Tawaravadee Resort is scheduled to launch under the BW Signature Collection by Best Western brand in the third quarter of 2018. Best Western Hotels & Resorts has identified Thailand as one of its key target markets. At present, the company operates nine hotels and resorts across the Kingdom, covering five of its brands: Best Western®, Best Western Plus®, Best Western Premier®, BW Premier Collection® by Best Western and SureStay Plus® Hotel by Best Western. But this nationwide portfolio is expected to increase, as Best Western has 17 new properties in the pipeline for Thailand. In addition to the launch of BW Signature Collection by Best Western, the company will introduce Vīb®, its vibrant and modern millennial-focused hotel concept, to Thailand later this year.